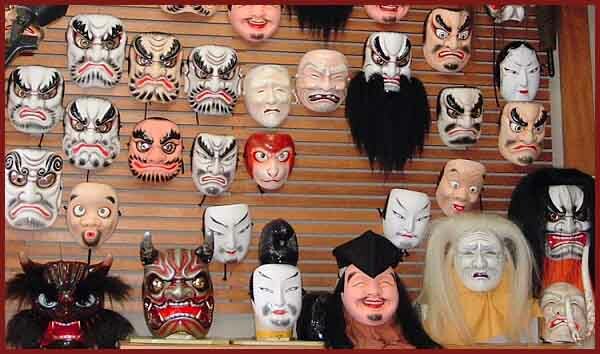 Masks have been used for ritual dances since olden times. They can be carved from wood or made from other material. 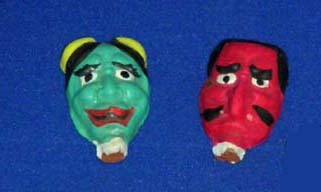 Simple papermachee masks are often sold at festivals for children to enjoy (and their parents). Some masks are famous regional amulets.
. Daruma men 達磨面 Daruma Mask .
. 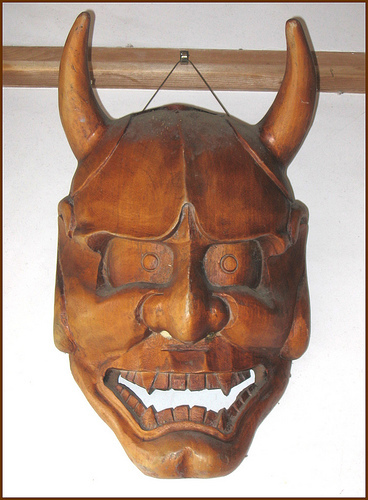 Mask of Fudo Myo-O　お面不動明王 .
. oni no men 鬼の面　Oni demon masks / kimen 鬼面 .
. Tengu no men　天狗の面 mask of a Tengu .
. tsuina 追儺 "demon exorcism" masks . 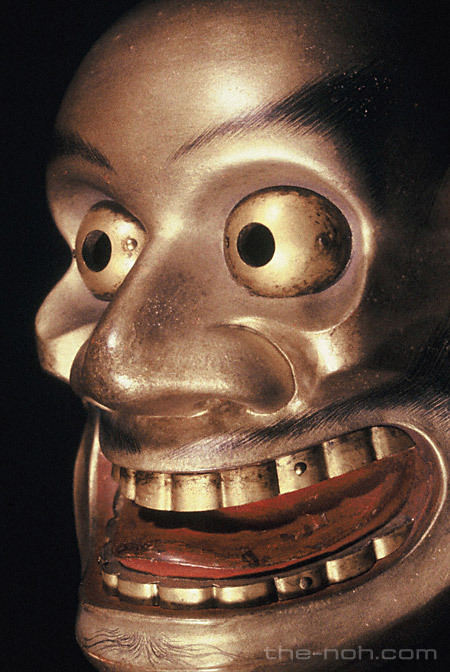 This mask is used in Japanese Noh theater, representing a jealous female demon or serpent. It has two sharp bull-like horns, staring eyes, and a leering mouth split from ear to ear. 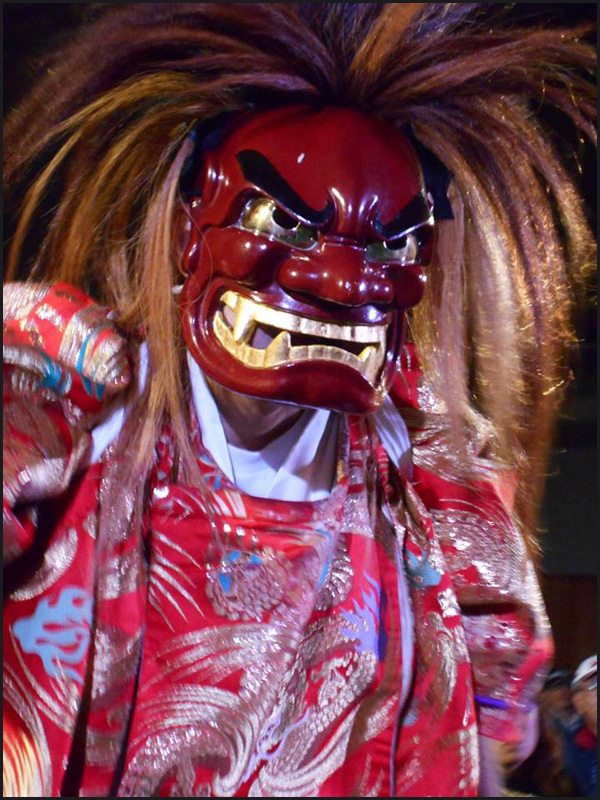 Click on the photo to see one more of my Demon friends.
. Noh (能 Nō), or Nogaku (能楽 Nōgaku) . 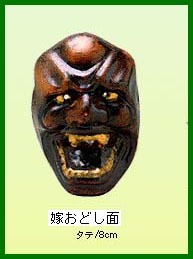 Beshimi 癋見 / 閉歯見 portraying goblins such as Tengu. 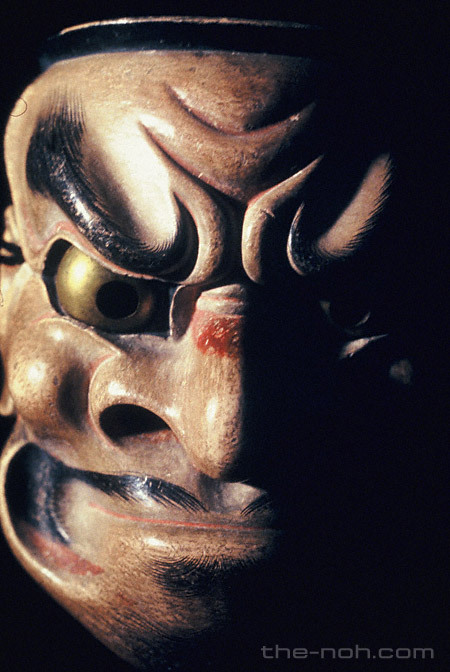 - beshimi means mouth clamped firmly shut.
. Shooki no men 鍾馗面 Mask of Shoki . They are the only one's of its kind in Japan. About 4 cm high.
. Doll Flutes 人形笛　ningyoobue、ningyoo no fue .
. Ehime Folk Art -　愛媛県　. Once a mother-in-law wanted to scare the bridea and put on the Demon Maks. But in the end she could not get it off any more (since she was the ONI of the household, after all). The pious bride chanted prayers to Amida Buddha and finally mother was saved. The 8th generation chief priest of the Hongan-ji temple, Rennyo Shonin, escaped from Kyoto after being persecuted by the Hieizan sect. He arrived at Yoshizaki Mountain, where he opened a monk hermitage 御坊 . 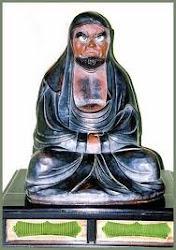 Shonin left important achievements and tenets of Buddhism during his stay in Yoshizaki. This became the basis for the establishment of Shinshu Kingdom. Today, the ruins of Gobou are designated as a national historical site. It was rebuilt as a park and includes a bronze statue of Shonin that was created by Koun Takamura. This area is surrounded by Kitaga Lake on three sides, and has gorgeous scenery. 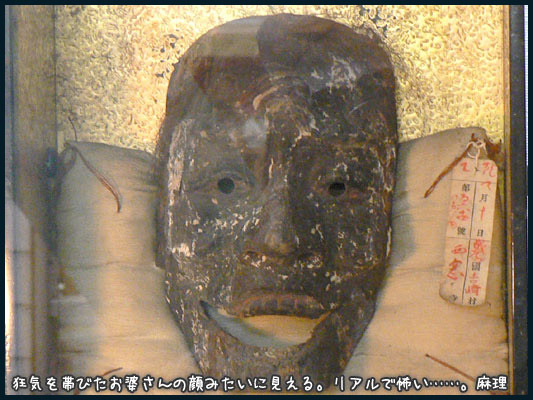 Tengu mask from mount Kashozan .
. betchaa men べっちゃー面 masks. There are more than 50 types.
. 舞楽面 Bugaku dance masks .
. Iwate Folk Art - 岩手県　.
. Kagura Dance Masks from Hayachine Kagura 早池峰神楽面 . oni kenbai 鬼剣舞 "demon sword dance"
. 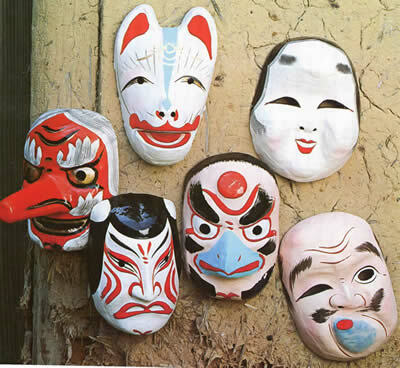 Saga men 嵯峨面 masks from Saga .
. Yokagura 夜神楽　Sacred Night Dance - Kagura Masks . 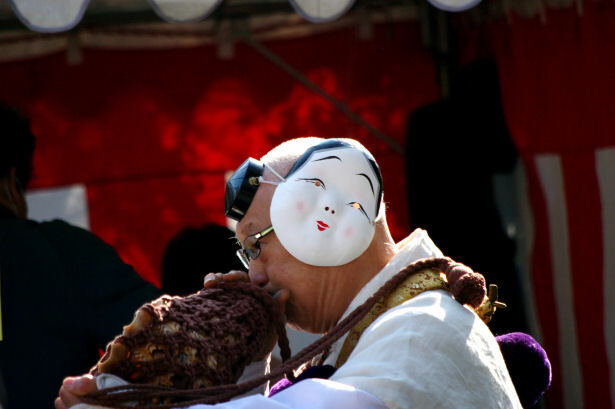 Men Buryu is a traditional mask dance handed down in the southwestern part of Saga Prefecture including Kashima City. Although the styles of dances differ from town to town, they are mostly performed at autumn festivals in each area. It is said that the word “Buryu” derives from “Furyu School,” a school of lion dance handed down since the ancient times. Men Buryu dance is a kind of ritual performing art that is dedicated to pray for abundant harvest and rainfall. 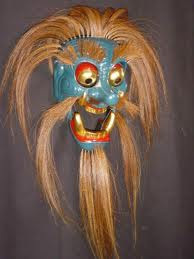 Wearing Furyumen, a mask looking like a demon, over the face, an indigo happi-coat with bold patterns and white momohiki-pants and dangling a small drum from the neck, the dancers dance fiercely to the sounds of Japanese flutes, drums, and gongs. 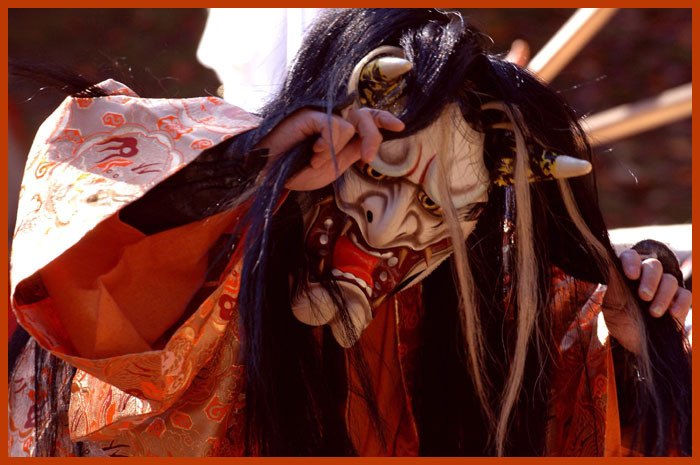 According to one theory, the dance originates in an old story that during the Warring States period (1493-1573), the lord of this area made his soldiers wear masks of a demon or a Chinese lion and Shaguma (a wig of long horse hair usually made of wool or hemp) on the head when they went to war. Then the soldiers made a night attack on the enemy while beating drums and gongs and gained a victory. However, another theory states that Furyumen mask was contrived to get rid of the evil spirit that damaged the crops and to pray for rich harvest. To be sure, their brave dances are powerful enough to get rid of the evil spirit.
. Inari no men 稲荷の面 fox masks　.
. kanakanbutsu かなかんぶつ Kanakan Masks . 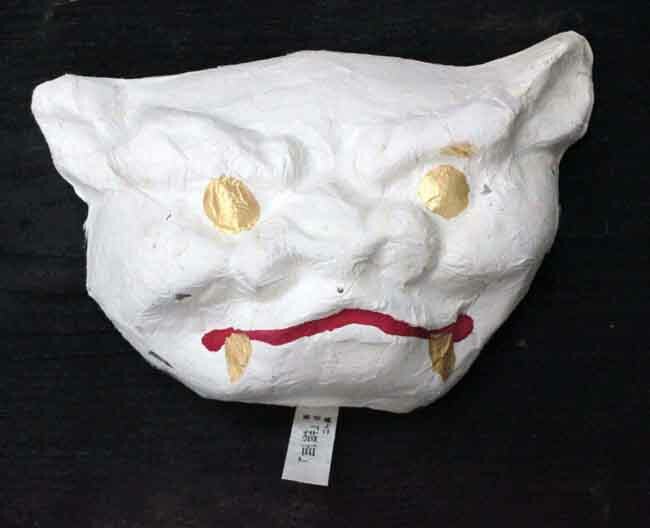 Whereas most kagura masks are made out of wood, for the past hundred years in the Iwami region they have been made out of the local paper, sekishu washi, a UNESCO listed material. Here is a haiku using a Noh mask as an image, from "The Haiku Apprentice: Memoirs of Writing Poetry in Japan," by Abigail Friedman ( Berkeley, Ca. ; Stone Bridge Press, sixth printing, 2011). When I once asked Momoko to send me a few of her favorite haiku that she had written, she included interpretive notes for each of them.